The Nursery Glider Swivel Rocker Chair from Delta Children is casual and cozy without comprising on style. Amply padded, the chair sits about a gentle swivel and glide mechanism, and creates an environment that you and your baby will love to relax in. 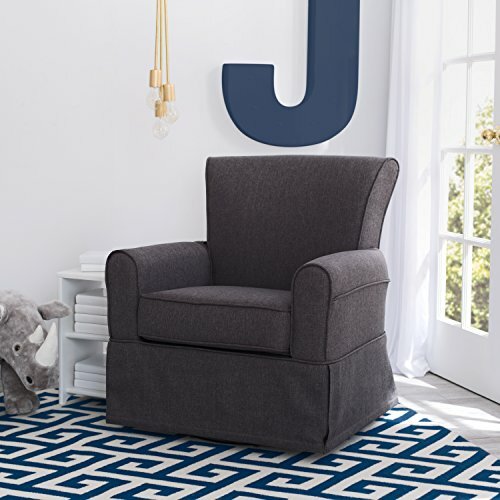 Crafted with a supportive back and sturdy wood frame for lasting strength, the Nursery Glider Swivel Rocker Chair is upholstered in a super-soft fabric with a matching wrap-around skirt that works well in any room--not just the nursery. Delta Children was founded around the idea of making safe, high-quality children's furniture affordable for all families. They know there's nothing more important than safety when it comes your child's space. That's why all Delta Children products are built with long-lasting materials to ensure they stand up to years of jumping and playing. Plus, they are rigorously tested to meet or exceed all industry safety standards.